Give an ancient touch to your décor and add the art of Iran into your home by placing this “One of a kind” hand-knotted silk area rug. This is 100% handmade in pure silk on silk material. It is ideal for a low traffic area such as a bedroom or a guest room. Exclusive hand-knotted silk area rug which is made in pure silk material. This carpet contains Ardabil design which is a very famous and classic design in the traditional carpet. 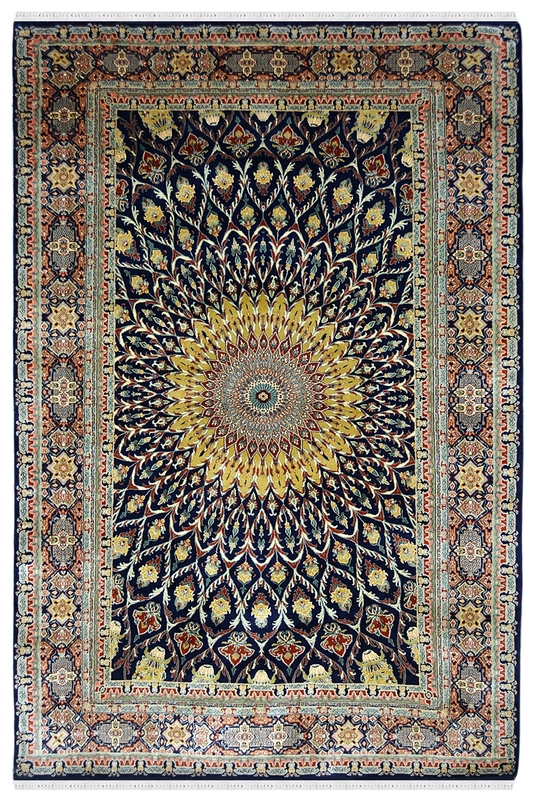 The design of this carpet is inspired by the bings of peacock and beautifully woven in this carpet. It is made in India by our talented weavers. So give a classic and traditional touch to your decor by placing this "One of a kind" handknotted silk area rug in your home. You can also it as a wall hanging carpet.